When the white settlers moved into Texas, they found a breed of wild cattle tenaciously foraging the dry land, finding water to survive when other, less hardy animals died. For the most part, the settlers left the wild, cantankerous beasts to themselves. But after the Civil War, returning veterans began herding these long-horned cattle north for sale in the gold fields and the Kansas feed lots. Driving these animals was a tricky business. Longhorns were not placid, domestic animals; they were wild, jittery beasts who became restless when thirsty. Thunder and lightning storms could set them off. 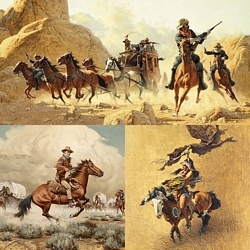 In "Turning the Leaders" a cowboy is trying to turn the lead steers toward the rocks. If the cowboys can slow the lead cattle, the rest of the herd will also slow and the stampede will end as suddenly as it began.